This was a "Max" weekend for me. On Saturday, I had the honor of attending the baptism of Max Anthony, a beautiful 6 month old who was welcomed into the Faith. Congratulations to Max - and also to his big brother Frankie, and his mom and dad, Irene and Don! I also had the pleasure of checking into the St. Maximilian Kolbe Net on the 75 meter band. I had been a frequent checkin to the net in years past but my "sked" had fallen by the wayside in the past year. It was a pleasure to resume my participation in the net for the second week in a row. (For any interested hams and short wave listners, the net meets on Sunday nights at 7:00 pm ET on 3.814 MHz). Who was Maximilian Kolbe? 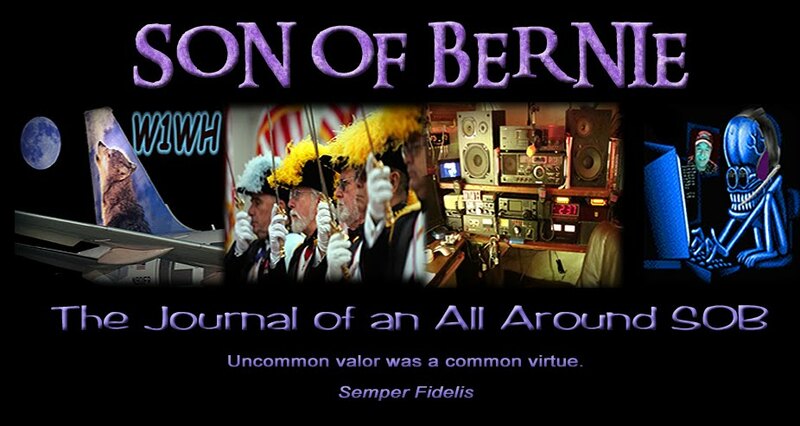 He was a Catholic priest and a lot lot more - he is also a canonized 20th century saint and being former ham radio operator SP3RN, is regarded by many as the patron saint of amateur radio. Besides that, he was - and is - a whole lot more. When the Germans invaded Poland in 1939, Saint Maximilian was ordered to cease his religious publishing efforts . Before long, the Gestapo arrested Father Kolbe and imprisoned him at Amtitz. He was released, but only to be arrested again on February 17, 1941. This time he was sent to the dreaded Auschwitz, and there under an inhuman monster of a commandant named Fritz, he became known as Prisoner Number 16670, just one more of the thousands of human statistics living in the terror of that vast horror chamber. 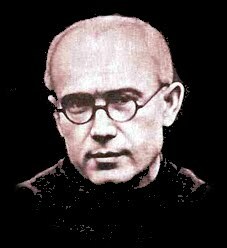 Maximilian Kolbe would have been hated enough by his Nazi keepers just for being a Pole. But he was a Catholic priest as well, and his tormentors reserved their finest cruelty for that class of prisoner. In spite of his obviously wretched health, he was assigned the hardest and dirtiest tasks in the camp. Dogs were set upon him supposedly to make him work faster, but actually more to torture the poor man. And should he stumble or fall in his cruel work, as he did many times, he would be beaten and kicked till he lost consciousness. It was late in July 1941 that a prisoner in his own block escaped. By three o'clock the prisoner was still not found and Fritz selected his victims. One of them, a man named Francis Gajowniczek, cried out, "My poor wife, my poor children! What will happen to my family!" At that moment Maximilian stepped forward. Fritz bellowed, "What does this Polish pig want?" The reply came: "I am a Catholic priest from Poland. I would like to take his place, because he has a wife and children." 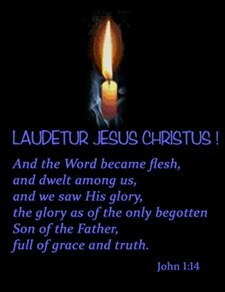 A witness recalls: "From astonishment, the commandant appeared unable to speak. After a moment, he gave a sign with his hand. He spoke but one word: 'Away!' Gajowniczek received the command to return to the row he had just left. In this manner, Father Max took the place of the condemned man." He was then sent to the starvation chamber. The secretary and interpreter for this bunker was so impressed by Father Kolbe's heroic actions that he kept an exact record of his last days, more detailed than the job required. Each day the guards would remove the bodies of those who had died. The sounds of screaming and crying were not heard from the starvation bunker. Instead, the sounds of Father Kolbe leading the Rosary and singing hymns to the Immaculata with the other prisoners in the bunker could be heard. While the guards were away, the secretary would go into the bunker to speak with and console the prisoners. When Father Kolbe could no longer speak from his hunger and lack of energy, he would whisper his prayers. After two weeks, the cell had to be cleared out for more prisoners. Only four prisoners were left, one of whom was Father Kolbe. The Nazis then injected a lethal dose of cabolic acid into each prisoner. Father Kolbe, the last prisoner left to be killed, raised his arm to the guard. On August 14, 1941, the eve of the feast of the Assumption, Father Kolbe was martyred. The next day, his body was cremated. On October 17, 1971, Maximilian Kolbe was beatified. Like his Master Jesus Christ, he had loved his fellow-men to the point of sacrificing his life for them. "Greater love hath no man than this ..." and these were the opening words of the papal decree introducing the process of beatification. Fr Kolbe's canonization was not long delayed. It was the Pope from Poland, John Paul II, who had the joy of declaring his compatriot a saint on October 10, 1982. So Max Anthony, you're in pretty good company. I'm proud to know you both. In a press conference at Apple’s California headquarters today, CEO Steve Jobs admitted that his company isn’t “perfect,” argued that problems with the iPhone 4’s reception aren’t unique to the device, and concluded that Apple will offer a free case for all iPhone 4 owners. Apple’s thin plastic bumper cases, which fit around the steel frame of the iPhone and insulate the device’s external antenna, should address reception issues, Jobs said. The cases had retailed for $29 at the Apple Store, even though analysts had estimated Apple's manufacturing cost for the cases to be between $1 and $2. “We do this because we love our users, and if we screw up, we pick ourselves up and we try harder,” Jobs said. The free cases will be offered at least through September 30, and users who have already purchased an iPhone case will receive a refund. The company has said that it expects its bumpers to sell out and will offer a limited number of other third-party cases for free. Apple’s flagship smartphone has been panned for weeks by the blogs, users, and even late-night television hosts because of a widely reported problem with its antenna design. Users who hold the phone on its lower-left hand corner — where the antenna is positioned on the iPhone 4 — have sometimes experienced poor reception and dropped calls when not using a protective case. But Jobs insisted that only 0.55% of iPhone 4 users have called AppleCare, the company’s technical support service, with complaints about the phone’s reception. He also said that the number of people returning the iPhone 4 is only a third of the number of those who brought the previous model, the iPhone 3GS, back to the store. Apple’s U.S. carrier partner, AT&T, has reported that, based on a preliminary review of call data, the iPhone 4 only drops about one call per 100 calls more than the 3GS. 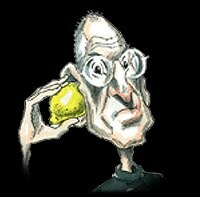 Jobs, who later said that he doesn’t use a case for his personal iPhone and has no problems with its antenna, then showed off the company’s $100 million testing chamber for smartphones and boasted that a team of highly trained PhD’s and experts carefully test each iteration of the phone that the company markets. Jobs also attempted to hold competing smartphones in ways that appeared to cause them to lose signal strength. During the question-and-answer session that followed Jobs’ presentation, though, an Apple antenna engineer hedged when asked why the iPhone would lose signal when it was simply touched in a certain area, rather than gripped. “When you touch the phone, you put yourself between the signal and your phone, so when you touch that spot you can attenuate the signal — and if you grip it with your whole hand — you can attenuate it even more,” said Bob Mansfield, the company’s chief hardware executive. Take comfort, Steve. I've worked for a long line of "imperfect" companies, within and outside the wireless industry. Maybe it's time to ditch the Microsoft testing methods before rolling the product out the door though. The Federal Communications Commission is the “most improved” agency across the entire federal government, according to the 2010 OPM Viewpoint Employee Satisfaction Survey released Monday, July 12 by the White House’s Office of Management and Budget (OMB). This survey is an annual online survey led by the OMB to gauge job satisfaction and motivation within federal agencies. The survey was distributed in March and reached more than half a million federal government employees. Maybe the FCC should worry a little less about it's own employees and a little more about its constituency. And the White House...don't even get me started. Hams who read my 6/23/10 posting will remember that I was critical of my now defunct Yaesu FT1802 radio which recently "went south" after 13 months (i.e., one month beyond the warranty period). I've read a number of postings on the internet to conclude that a fairly significant number of hams have experienced early failure with the 1802 (and many, of course, have not). Still, it bears watching. Well, I nevertheless took the plunge and bought a replacement radio (you guessed it, Yaesu's successor to the 1802, an FT-1900. At $139.95 with free shipping from Ham Radio Outlet, it can almost be considered a "throw away" radio. Still, the idea is to have it last somewhat longer than it's one year warranty period. Put the new radio in service the other day. The receive audio sounds very good and I'm getting good reports on the transmit audio. 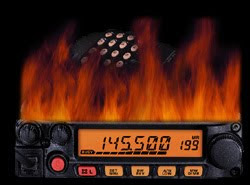 However, during one of my extended ragchews with K1KAR the other night, I noticed that the radio was almost too hot to touch! Another radio running hot...and the heat sink is not excessively large. The heat's gotta go somewhere, but having it run this hot is not good. I also noticed that the FT-1900 features an internal software setting that the old FT-1802 didn't have: a monitor for the internal chassis temperature. Well, "the doctor" quickly took the patient's temperature and found an internal temp of 139.1 degrees, just 0.9 degrees shy of the published upper operating limit of 140 degrees for this radio! I quickly backed the power down and shut the radio down about a minute later. It's obvious I'm going to have to add a muffin fan to help out, but it begs the question: is Yaesu's inclusion of the internal temperature sensor in the 1900 a de-facto admission of a thermal problem with the 1802 that they never owned up to? Heat is the enemy of all electronic components and frequently leads to premature failure. I'm not saying that I have a pending situation like the pic above, but who knows? I'm just sayin'...this one bears watching. The Maritime Radio Historical Society (MRHS) is a small group of dedicated individuals who share the goals of documenting, preserving and restoring the artifacts of maritime radio history. MRHS' area of specialization is the coast stations, ships and companies of the west coast of the United States. But anything to do with maritime radio anywhere in the world is of interest to the Society. Projects are aimed at the restoration and actual operation of historic artifacts. The Society's largest project has been the restoration of ex-RCA coast station KPH which has been returned to operation under the call KSM. While these projects keep MRHS busy restoring equipment and repairing antennas, this work forms the foundation on which the Society's real objectives rest. The purpose behind all our projects is to honor and commemorate all the men and women who came before us and, through their courage and dedication, made the profession of radiotelegrapher one of skill and respect. MRHS keeps their traditions and culture alive through actual use on the air so that new generations of listeners may still hear what a real marine coast and ship stations sounded like. "The end came yesterday. We knew it had to come. But the end had been predicted so many times for so many years while Morse soldiered on, paying no attention, providing good, reliable service for decades after it was declared dead... maybe some of us thought the day would never come. But when KPH/KFS signed off the air for the last time yesterday it was the end of commercial Morse in North America. I sat down next to Paul Zell as we listened to Russian and Cuban ships calling their respective coast stations. I realized that true to its nature, Morse will carry on in other parts of the world even after the keys in North America are finally silent. I had to ask Paul the question... 'How are you feeling about today?' An impossible question to answer but he answered it. 'CW was my life,' he said and turned back to the receiver. Now the final transmissions from WCC/WNU began. We copied them off the air. The room fell silent. I noticed one man in particular. He was probably the oldest person there but had a presence that we used to call 'spry'. He had a quick laugh and twinkling eye. I watched him now. He stood leaning forward, eyes closed, as the sound washed over him.... drinking in... the Morse. He was a pioneer operator, the genuine article, no doubt about it. I wanted to meet him, to ask his name at least. But of course I couldn't possibly interrupt his reverie. Then he copied the last commercial message KFS would receive, from the Liberty ship Jeremiah O'Brien/KXCH on 500kc. The op on the O'Brien said he would standby until 15 past the hour. Zell replied 'better make that 18 past, OM.' The operator on the O'Brien understood and said that yes, he would observe the silent period - which of course is no longer required by regulation but is absolutely demanded by tradition. Then Paul said that he'd standby 'on 600'. The crowd got a big kick out of that - 600 meters instead of 500kc. Subtle, but all the more meaningful for that. I saw Tim approaching me across the room. 'Get your key...', he said. Get your key! Holy mackerel, they were going to let me do it! So I got out the key, gathered up my messages, and plugged in. But then I realized: the best Morse operators in the country... the best Morse operators in the world, probably... would be listening to every dot and dash I sent! They would be too polite to say anything if I flubbed it of course... but they and I and everyone else in the room and all the ships at sea would know! My palms started to sweat at that thought but there was no turning back now. I took Paul Zell's seat. I sent a couple if Vs to see if there was side tone in the 'phones. The knob on the key was loose! I tightened that up... and began to send. I sent the first message from the Maritime Radio Historical Society and all went well. Then I signed the station calls.. 'de KPH/KFS'. Tom and a few others noticed that I sent KPH first and understood why. Then the second message from the San Francisco Maritime Historical Park. And the calls again... followed by my 'sine', RD, ... and AR. I had gotten through it! And there was a round of applause for me! Thoroughly undeserved but very much appreciated. Someone even said, 'Nice fist'. High praise indeed in that crowd. Then the final messages from KFS/KPH began. Paul Zell sent the first ones. Then Tim Gorman sat down and proved himself to be much more than just a competent manager. He sent the final message in meticulous Morse using the chrome-plated Vibroplex, signed off with 'What hath God wrought'... then SK... and it was over. There were wet eyes in that room, mine among them. I heard more than one tough-looking old timer mumble, 'I didn't think it would get to me, but...' and then turn away. 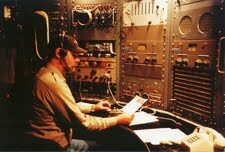 I had one further item on my agenda: to get my license endorsed showing me as an operator at KFS/KPH on the last day of North American Morse. Once again Tim Gorman showed himself to be a gracious and understanding man as he took pen in hand to write 'satisfactory' in the blank provided for operator evaluation on the back of the license and add his signature. Finally it was time to go. I gathered up my key and my photos and my papers and shook hands once more with all the great men and women who were there. And finally we were heading north on highway 1 with the beautiful Pacific sunset on our left and the green coastal hills on the right. 'That was one helluva day,' Tom said. 'Yep,' I agreed. "Looking back, that did seem a little suspicious..."
Hope everyone had a great Fourth of July! Still thinking about the about the 11 “illegals” rounded up this week and charged in the biggest international spy scandal in years. Got to thinking: how can you tell your neighbors are spies? When you ask where they went on vacation, they shoot you and bury your body upstate. When your daughter tries to sell them Girl Scout cookies, they call her a capitalist cretin and order one lousy box of thin mints. Use teeny-weeny camera to take family snapshots. It’s a beautiful day — and again with the trench coat? Only family in the neighborhood that drives a Lada. Every spring, house festooned with elaborate May Day decorations. They politely decline to answer questions about their matching Sputnik tattoos. When you all got together to watch the “Sopranos” episode in which the Russian gets away in the woods, they cheered. Rather than a lemonade stand, their kids sell shots of Stolichnaya out on the sidewalk. The parents return any children’s birthday gifts that have a Rocky and Bullwinkle theme, leaving a note expressing their preference for Boris and Natasha. When they’re away on vacation, you can hear small explosions and see smoke coming out of the mailbox from self-destructing letters. They name their Russian wolfhound puppies Che and Fidel. To get their backyard barbecue grill going, they use reams of microfilm. They knock at the front door in Morse code. Their satellite dish not only receives signals from outer space, it also sends them.